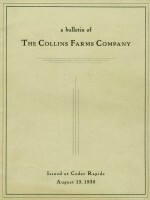 The family business predecessor to Collins Radio, the Collins Farms Company was definitely ahead it its time as an innovative leader in the field of large-scale agriculture. By 1930 this company was managing over twenty-five thousand acres of Iowa farm land using all of the latest farming techniques that were available at that time. The caliber of the personnel hired to serve as engineers, supervisors, and laborers is reminiscent of what made our radio company so successful. One can compare the attention given to engineeering detail in this document to what young Arthur applied to his radio transmitter construction methods. As we all know, the lingering problems following the 1929 stock market crash and following economic depression took its toll on crop prices making it nearly impossible to survive in any farming business - small or large. —Thanks to Mark Hovda for contributing the original document. click to read While you're perusing this document, take a close look at the group photo on page 23. Although it's been over eighty-five years, do you recognize any of the men in the photo? We're pretty sure a young Arthur Collins is standing in the back row - third from the right. Drop us a line to: the editor.